Cupid is the clear winner from this batch. Still watching and enjoying it. I’ll keep watching TV until they stop making it! The anti-marriage group National Organization for Marriage is planning another ad against gay marriage. Before the last time that they put out an ad, a full 33% of polled Americans supported gay marriage. After their ad, the number has been battered down to… 42%. Let’s hope this one is just as successful. Some quick notes on some not-that-notable debuts I should’ve long since blogged. Sit Down Shut Up is one that I should like, dadgummit. It’s an animated series with a school setting, mixing creative staff and actors from Arrested Development with voice cast from Saturday Night Live. Bunch of things I like there. But when you add it up, the total is much less than the sum of its parts. It’s built around the wild characters of the faculty of the school, which to some extent uses a humor like Arrested Development, only more broadly drawn — and the drawn part is the problem. Whereas Arrested Development dealt with the banality of human existence, and all the characters (for better or worse) were thoroughly human at heart, Sit Down has a bunch of drawn characters, designed to emphasize there ridiculous characteristics, and thus dehumanized. Think about the basic characters of The Simpsons and King of the Hill — their basic looks aren’t funny. They’re open, you can certainly do funny things with them visually, but at heart they are human. Gag looks are saved for supporting bit players like Professor Frink and Bumble-Bee Man. That all might be fine if we were looking at still pictures, but we’re not. These folks need to come alive – and there is no chance for them to surprise you, no chance for them to be anything besides just what they look like. Meanwhile, in the world of the traditional three-camera sitcom, we have… a traditional three-camera sitcom. Surviving Suburbia is a goofy dad with a pretty wife (played by a much-younger actress) and goofy neighbors, and dad has schemes to get away with things which backfire on him. It is basically the default sitcom of most of the past forty years, the kind of basic sitcom that actually seemed just on the edge of dying out, with the cancellation of According to Jim. And yet, that’s a good thing. There’s nothing wrong with basic sitcom 101. If well done – and that’s an if – it can be a basic half-hour entertainment. What’s wrong is when such things are flooding the airwaves, when there’s little but, and when they’re badly done. So is this one well done? So-so. The good news is that most of the acting slots are filled by folks with strong and/or successful sitcom credentials (Bob Saget, Cynthia Stevenson, Jere Burns.) They deliver well what they have… which, in the one episode I saw, was ho-hum material. This will never be a special series, never be wonderful. But if you want something to watch, it’s a lot less painful than most recent sitcoms with loftier goals. Adequacy, thy name is Surviving Suburbia! The in-laws are in town — who better to experiment on! 20 ounces of ground turkey breast. 3.5 or 4.5 pieces of matzoh (one piece of which was egg matzoh), soaked in boiling water (to avoid the crunchy/burnt effect that served the earlier Goldfish-cracker meatloaf so poorly. Set the oven to 365 degrees, which I think means the oven is actually about 400 degrees. Stuck it in for… as long as it takes. Result: Pretty good, actually. Not the best, could’ve used a bit more flavor (teriyaki would’ve been a good idea, and a dab of BBQ sauce was good on it), but that’s always a risk with turkey breast, which is naturally bland. Overall, a sweet loaf. The matzoh worked fine, mixing in for bulk and a bit of texture. As I always end passover with several boxes of matzoh left, expect its usage to be an annual occurence. Just stumbled on a couple of bargains for Paul Gross fans. The complete series of Due South, all 68 hour-long episodes, for under $20! The complete series of Slings & Arrows for under $30. This is a Canadian series (so short seasons), a comedy (if serious at times) about a theater festival. A bit snobby, but a must for those who have spent time in the theater. And if you weren’t a Paul Gross fan before this, you probably will be… particularly if your taste runs to men. I stopped by the 99 Cents Only store yesterday, because I was hungry and wanted to quickly grab a Snickers Charged, not because I think that “energy” candy bars are a good idea, but because I’d bought one there the previous day, because I wanted Snickers and that was the only Snickers they’d had. I had to dig a bit on the shelf to find one, but find I did. But when the checkout clerk dragged it across the scanner, a big red box showed up on the register’s video display. CLERK: I’m sorry, I can’t sell this to you. It’s been recalled. ME: But I bought one here yesterday, and ate it. Am I gonna die? CLERK: You’re okay – it wasn’t recalled yesterday. I like the texture of Southland, the new cop drama that’s inheriting the long-running home of E/R. It’s a very gritty, very dark, hyper-pseudo-real vision of the bad parts of Los Angeles. It makes you want to invest yourself in its realism. Problem is, in the midst of its dark situations, it layers itself with cliches. The central character is the new guy who wants to be taken seriously but is struggling with being seen as a rich boy and a son of privilege – you know, just like the lead on The Unusuals. Or the female character in the most recent Cupid. Or… well, you get the idea. You’ve seen it. And in this instance (as well as some others), it comes across as classism and borderline racism. The underprivleged are all destroying each other here, and what we’re really supposed to feel for is the problem of the overpriveleged being faced with the fact that people recognize them as overpriveleged. There are ways to do this without the response being “boo-effin’-hoo”, but the pilot episode certainly didn’t achieve them. And then, to rachet up the drama, this son of money shoots and kills a suspect on his first day out. His first day. The vast majority of police officers go through their entire career without ever firing a gun, without ever even pointing it at any one. Killing someone your first day out? That just makes this desperate, false play for high drama. I suspect I’ll watch a couple more of these because of the texture. And I’ll keep hoping it will turn out to be Boomtown. But with the E/R folks behind it, I suspect it will just be dreary and self-important. Of course, originality is overrated on a day-to-day basis. When works is what works. Originality is only for those who are trying to seem unusual, like, perhaps, the lead characters of a series called The Unusuals. They get someone to confess by getting him to believe that a photocopier is a ile detector. That’s real original… or at least seems original if you’ve never seen the NYPD Blue episode that used it. Or the episode of Homicide: Life on the Streets. Or The Wire. Really, it’s the case of being the same sort of nonconformist everyone else is. And it’s just one example of how the unusuality of the characters depends on not having noticed similar characters before. The rich girl who doesn’t want people to know she’s rich so they don’t look on her as otherwise favored, the cop who has a deathwish because he’s dying anyway, we’ve seen these folks before. Amber Tamblyn is pretty charming as the rich gal, but that’s usual for her. There are some parts in here that could work, some okay actors, but they’ve got to find some fresh center to the faux freshness of the series. 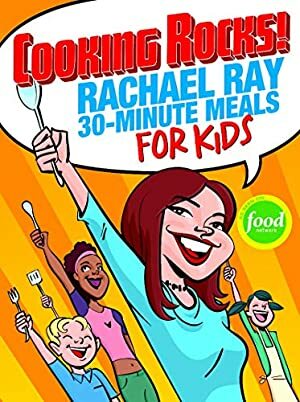 I know the economy is bad, but really, Rachel Ray – you want people to serve cooked rocks as meals to kids? That’s just taking things too far!